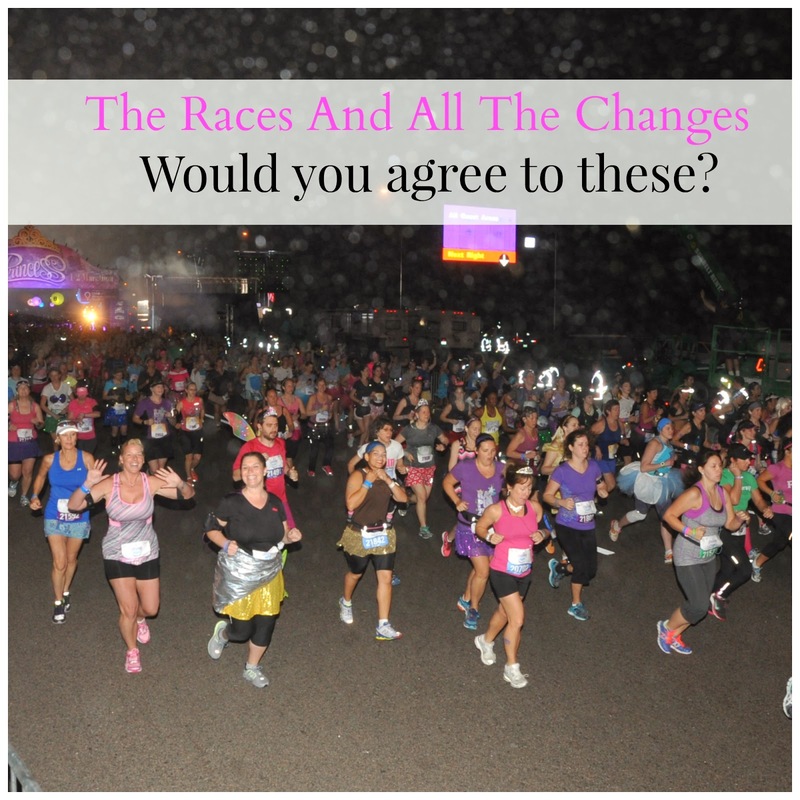 Fairytales and Fitness: Races: Would you agree to these changes? Yes, we often those something along those lines too. 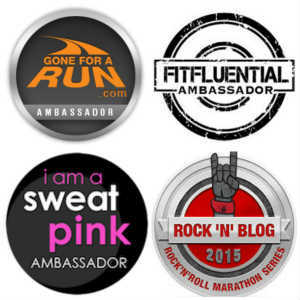 There should be "finisher" medals and then there should be "participation" medals. Although i'm sure that would increase the price even more because now Disney would have to buy 2 different medals cus they have no way of knowing how many people might not finish! The Marathon Monday was just in 2011, because race registration was down...hard to believe now, huh? Gah! I just responded and when I hit publish it all disappeared?!?!? I didn't realize they had pre-order for jackets, is this new? They have to figure something out about the merch! I wanted a PHM jacket so badly and by Friday at 1pm they were gone. They are losing money not having enough available too. I wouldn't want the races turned around, I'm not sure I could do another race (even shorter) after pushing through a half. This way I can take it easy/have fun taking photos for the 10K and be ready to push for a PR during the half the next day! Thanks Karen! For every disney race, there is always a few items you can Pre-order at the time of registration. I know pins and necklaces are always on the list. I thought jackets were too, but I could be wrong. After the expo at PHM, I decided to go ahead and pre-order just to be safe. I can't wait to see what I bought! My sister ordered the necklace last year for her first marathon, so I went ahead and ordered it too. I 200% agree with ALL of these. Also, I didn't pre-order the Dopey jacket and now I'm kind of regretting it. :0( I plan on getting there day 1 of the expo, though, so I am hoping I can still snag one. I would also like to add something to the list! Disney should give out different/more options for post-run snacks...like Mickey pretzels, or this Tonga toast everyone raves about (I need to try it), or Dole Whips!! Tonga toast may be a little tricky to give out at the finish line, but a Dole whip would be excellent. Since you are getting to the Expo on day one, you should hopefully have a chance at getting the jacket in your size, if not than that is REALLY poor planning on Disney's end to have merchandise sell out on the first day. Don't forget that you can use your Disney Visa for a discount on that jacket too! Something we weren't able to do since we bought online. Thanks for visiting! Even with all the things we would like to change, Disney races truly are wonderful and I think every runners should experience one of them at least once! I do understand how crowded that would be, especially if all the free tickets had to be used on the same day! It's a nice thought though. I really like that first idea! I would want to get through the toughest race first. Yes, those are our thoughts too. Get the big one out of the way, and then just have fun ( on tired legs). But once I experience the race change, maybe I wouldn't like it so much, who knows! I've noticed some races have a separate store that has merchandise ready to go. Can't Disney do that? I feel like keeping the designs a secret adds a very unnecessary frenzy to the expo, and if they're not going to plan for the frenzy, why do it? If the stuff isn't ready to go, then have a pre-order so they know what needs to be filled. They can have a separate booth where people can pick up the stuff they've ordered. I have noticed that some merchandise can be pre-ordered now. I haven't done it in the past though. This is the first race I ever ordered anything during the registration process! Great points! I heard someone saying something similar about Disney challenges for people who didn't want to do the full marathon. One of the guys on a podcast I listen to did the 5k, 10k and the half and said he did the "Grumpy" since he didn't get an extra medal. It would be nice to have a fun challenge the January weekend for people who aren't quite ready for a full marathon. Oh, I think calling that race the "Grumpy" would be perfect! I even heard some one mention that doing the 5K and 10K should be called "The Bashful". I think that's pretty clever! I ran the marathon the one year disney gave a free park pass on monday after the race, and not gonna lie the parks were a crowded nightmare that we usuallydon't experience the monday after a race (most ppl go home sunday afternoon or monday) But, they used it as an incentive b/c they were having trouble filling up the marathon that year. Now that there are record sell outs, they don't need to offer it anymore. Would it be nice, absolutely, but supply and demand won't allow that to happen anymore. I also think it would ne nice to run the marathon or half first and then the 10k or 5k but they would never do that. 5k ppl run the 5k and 26,000 run the half, and a lot of ppl can't get off work to run a marathon on a thursday or a friday, and with the numbers o skewed ut doesn't make sense for them to flip it around, but it would be nice! Yea, a lot of these things would be nice thoughts, but logistically speaking you are right. It would be a hassle for people to swap races, and if everyone had to use their free park ticket on the same day I am sure it would be very crowded and not much fun for people. Although, it may get people to stay one extra night, which would make Disney happy, if they are staying on property! I love all of your points; definitely gave me something to think about. If I had any power, I'd totally hire you to be in charge! runDisney is it's own animal, but I am noticing the running stores in NYC have a lot of the bigger races official merchandise (ie TheBoston Jackets were in the running store I go to all the time and for NYCM they had a LOT of stuff that was being sold at the expo. The NYC Niketown also has Nike Women's apparel, as well as a bunch of running stores in DC) which makes it nice- if you know about it. Plus, Adidas and Nike both offer the merch online, so if I were ever to run Boston, you better believe I'm not waiting until the expo to get my jacket. I'm really interested to see what the Disney marathon jackets look like. It's a step in the right direction, but still not quite there yet. Thank you for your vote of confidence Abby! I think it is So cool that the merchandise can be found in many of the stores in NYC. Do you think many non-runners buy that stuff too? Just curious. I think having it available to the public like that would be a great way for runner's to get some cool gifts! I would love to be able to walk in a store and buy my sister some Boston merchandise that she wasn't able to get at the expo! Yea, I think there are plenty of races that could tweak a few things here and there. Not just Disney, right? Yes, I would definitely agree with that! Especially if they don't know who is going to make it to the expo and who isn't it. Extended packet pick up would make much more sense than moving the bibs to a resort...haha. Although I'm sure transportation would might be an issue since they generally contract out to Mears. I just read this on Twitter from Jeff Goins, writer: "The things that bother you are the things in this world you are meant to change." Okay, so maybe you can't change all that with Disney, but maybe if you write them about it they'll listen. You never know! I haven't done any Disney races, but I agree that there should be some challenge for people who are just starting out. I also love the pre-order idea! Haha, That is a great saying! 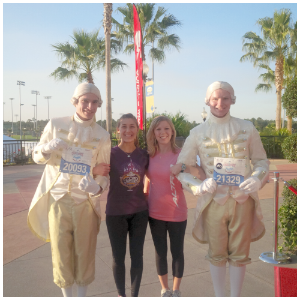 We are just having a little fun here on the blog today, but in all seriousness, Disney races are great. you should try at least one of them! I actually just looked to see if a day at Disney was included with the race...shocked to find out its not. Nope, no park ticket. Although I've heard from people that one year they did give a ticket out to participants. I guess that caused some over crowding. I would love to run the races in reverse order with the harder races first and the easier ones last! I think that would encourage more people to compete in challenges because it would be more fun to have the smaller races last. I am considering doing the Ultra Gasparilla Challenge next February and they do the 15k and then the 5k on Saturday with the Half followed by the 8k on Sunday. I am most worried about running the Half and then the 8k, especially in one day and you basically start the 8k right after you finish the Half is you are a slower runner. I also like your idea about extra swag! One of the best races I ran this year was a 10k that gave you a medal and a really nice stemless wine glass. I was really impressed by that! I'm really hoping that with runDisney's new packet pick-up policy, that they will extend expo hours. It can be hard to make it there on time, especially in the winter months when weather can effect your flight schedule (something you can't know in advance and have no control over – even if you plan to leave a day early... you just never know). They should definitely have more merchandise in stock. I hate getting there and seeing something I really want, but am unable to purchase because my size (and I'm usually willing to go a size up if need be) is sold out, even just a few shorts hours after the opening. All great ideas! I'd also add that for runDisney races, I'd like to see better swag bags. I'm sure it comes down to money, but still, I bet a lot of their sponsors would love to give more samples in those bags. For the Gate River Run 15k we got awesome glass mugs with the race logo and the sponsor's logo on it. That was a special touch for a race that had a much cheaper entry fee. I've wondered too about the $80 Marathon weekend jackets. But I didn't want to take a leap there, since that should be up online and available for several months. In that time, surely they will post a photo of the jacket. There should actually be a separate link to pre-order, like they do for pins, necklaces, and Dooneys. These are all great suggestions. I especially appreciate your challenge suggestion. I did the 10k and half in January, which if I were at Princess or Disneyland would have given me a third medal, but during Marathon Weekend did not. It would be nice if runDisney offered all multi race finishers an extra piece of bling. Your merchandise suggestion is right on the nose. Too bad there's people who want to round up all the merchandise and resell it online. It makes it difficult for the runners to make sure that they can get the merchandise that they want. I think I heard that runDisney is allowing preorders for jackets for Marathon Weekend. I hope they start doing this for all of the races. It is SO hard with races that don't have day-of packet pickup, and although I understand why, it's very difficult for people who have to travel to get to race destinations in time for packet pickup day(s) prior. Very interesting post!!!!!!!! I wonder if Disney has thought about these concerns! I love brainstorming new ideas! The list y'all came up with is fun, but I for one would not want to do a challenge "backward" - I think it would feel anticlimatic ;) But that's just my .02! !